Yes, Buick’s move to front-wheel drive will improve market share, increase sales, and cut costs through platform sharing. But they’ve really lost their way. Consider, for instance, my uncle Ned, who bought an Electra Limited new in 1979 with a Charcoal Firemist exterior and a blue dashboard. They are abandoning customers like Ned, loyal customers, who might again buy a new car sometime in the next few decades. So then it came time for questions. Here we are, a bunch of self-important automotive journalists sitting in a huge banquet hall in front of Alan Mulally, who’s waiting to answer anything we might ask. And the first question? You guessed it. Alan Mulally responded to this question with unwavering tact. He took a long look at the man, smiled, walked into the crowd, and strangled him with the microphone cord. No, that isn’t what really happened. Mulally gave the guy an eloquent, articulate answer filled with words like “segment” and “market share.” I probably would’ve strangled the guy with a microphone cord, but that’s why Mulally is a multi-millionaire, and I’m sitting here, writing this column, eating cookies without any pants on. Anyway: I say all of this because, despite my contempt for the car journalists who constantly complain about how much better everything “used to be,” I’m about to become one of them. To do that, I must take you back to 1999. We all remember this year vividly, since we spent it worrying about how the Y2K bug would crash our computers and return the United States to an barbaric society based primarily around the fur trade. (As a middle schooler, this was a pretty big worry for me; right up there with detention.) But it was also the year BMW was at its best. The 5-Series of the period, the E39, is edging ever upwards on the Mazda Miata Scale of Cars We’re Always Looking at on Craigslist. There was that gorgeous 7-Series, which screamed “serious German businessman,” right before the Bangle redesign, which made serious German businessmen scream. Sure, the Z3 had its issues – but the 1999 model year heralded the arrival of the “M” model, which came in two bodystyles: a convertible, which looked like an aggressive sports car with fender flares, and a coupe, which looked like a clown shoe. Plus, the Z8 was on its way. It was a great time to be a BMW fan. So let’s fast-forward a bit, if we may, to the present. My favorite of these actually isn’t on the road yet. You know how the 6-Series Gran Coupe is just a 6-Series with four doors? Well, it turns out they’re also going to do a 4-Series Gran Coupe. In other words: a 4-Series… with four doors. 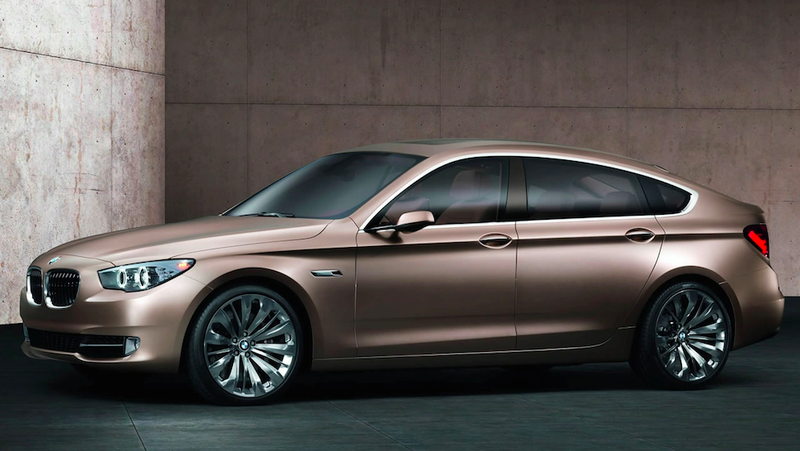 Now, you might think this is a 3-Series, but you’re wrong: it will actually be a 3-Series with a 20 percent markup. It’s not just the bizarre segmentation that has me concerned. The lust for BMWs isn’t as strong as it once was. Maybe I’m wrong, but I seem to remember a time when it was about more than the lease rate on a 328i. A time when the turn signal stalk felt like a small explosive couldn’t separate it from the steering column. A time when the doors closed with a beautiful click that said: “Welcome to German engineering.” A TIME BEFORE BMW LOST ITS WAY! Of course, BMW’s response to all this would be: Who cares if we lost our way? We make more money now than we ever did before! It’s the kind of thing you might hear from your bleeding heart liberal college buddy, who gave up his job as a public defender to go into big law and make a fortune. It’s also the kind of thing Mulally probably said to that journalist who asked about the Crown Victoria. Now let’s hope BMW doesn’t strangle me with a microphone cord.